AX Cygni: A Carbon Gem! There is a degree of admission/self-chastisement with this........I pride myself on finding objects pretty quickly, all other things equal; but a few nights back was an abject failure to locate it. Looking for carbon stars on Sky Map Pro 12 I had mentally booked this for a looksee, so on May 26/27 the debacle commenced and a soon light sky had me giving up. Out observing I’m in the zone: laid back, self-assured and pretty much unflappable unless something like those guys ‘lamping’ hares with high-powered torches in the adjacent field turn up. Out of sight of me at the scope but the inside of the back of the observatory gets to look as though there is a lightning storm going on – when I feel like shouting “No hares in here........**!!**!!”..... but best not to antagonize with an exposed scope.............! No hare-hunters of late but that’s the measure of how rattled I was with the AX Cygni failure. Edited by David Gray, 04 June 2017 - 03:36 PM. Beautiful, exquisite! I must get a sight of this one. I love ( though I'd hate them too ) your "hare" raising story. Ah not a problem in my suburban backyard...just an occasional large racoon ( and they don't yet carry torches of any kind, but that day may be coming ) Seriously now, I love that sketch and that color. Next clear night ( maybe Thursday ) and even with the moon around, I must try to see this one. Regards, clear ( and hare free hunter ) skies! Great sketch with quite dramatic colors! I pay attention to star colors during star-hopping. I just make small remark in my logbook and later at home, I'm trying to find out more about the stars. Many times, this is an interesting star (variable star, red giant, etc...). Last time, when I run on carbon star, it was at the end of March while searching for comet Tuttle-Giacobini-Kresak with my 82mm refractor. The comet was at the Draco's tail. I cruise rarely in this region. In fact, I run on several pleasant surprises in there. The first one was star 10 Dra close to Alpha Draconis. It had strongly golden hue (at home I have found out this was variable red giant M3.5III known as CU Dra). Second nice field had 4 brighter stars (kappa, 4 Dra, 6 Dra ad BD+70 707) with nice color contrast (4 Dra and 6 Dra were orange, while kappa Dra was bluish, the last star was yellowish). And the third surprise was nice bright pair 8 Dra and carbon star RY Dra. While 8 Dra was crystal white, RY was strongly red. What an exquisite FOV! Beautiful sketch, David! Carbon stars are wonderful to look at on any good night. I tend to incorrectly estimate the brightness by a few tenths of visual magnitude because of the well known Purkinje effect. Very nice sketch of AX Cygni: (A Carbon Gem!) . That is a very interesting star field alright. 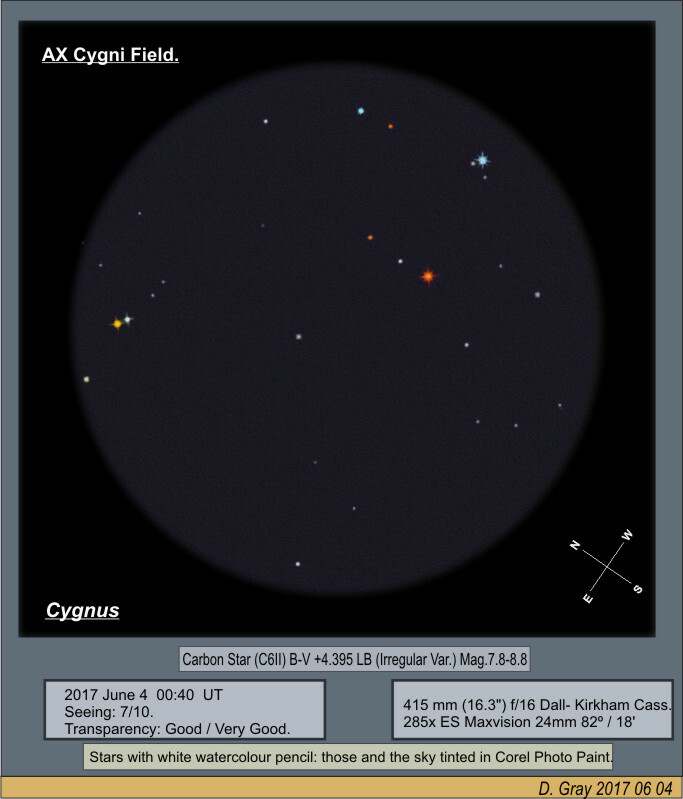 I did observe AX Cygni way back in 2003. Perhaps I should revisit it again soon. It is after all very near one of my favourite double star -Delta Cygni (Rukh). There surely are quite a few orange stars nearby. Thank you for your excellent sketch. Frank: I had considered the Purkinje Effect; but maybe a bit less simple in that I suspect the indigo hued sky might have been a factor. My judged mag. 7.5 was not really a ‘formal’ estimate as I had not chosen a ‘similar’ comparison to make one. Staring makes the effect worse I find and that is also something I avoid with colour impression seeking in particular. Rather I spend around a second to look at one star then shifting to another in the field and back and forth and etc. I find a sustained look tends to leach out the colour – especially working with near-scotopic vision; and further feel that the vision works best with the relative-colour effects/impressions of quick inter-comparison. This allows me to get relatively delicate hues to near mag. 13.0 with the 16.3" D-K on good (dark) nights and in presumably close to being scotopic. Edited by David Gray, 06 June 2017 - 03:32 PM. Beautiful starfield--nice to look at your sketch. I can only see the most obvious colors in stars. You have a talented (and trained) eye. You nailed that rusty tone a lot of redder stars have. Excellent drawing, good color. I agree with the "burnt orange" color that so many of these stars present to my eye. Nexstar 8 133X medium orange, Good Color. In a rich field around this carbon star. Many Thanks Michael, Pete, Steve. I’ve thought for some time that there are two basic ‘themes’ to the hues of these stars: where I might put some in a slight yellow-toned hue and the other where there is a distinct polished-copper tone underlying. Of course not possible to compare them side by side and all sorts of factors cloud the issue..........conditions, physiological, optical etc. etc. Two of my favourites V Aql & VX And often seem in that polished copper region to me. Got a quick look at V Aql on the 9th and was musing that when it comes to tinting in Corel it might need a slight addition of magenta to the reds/oranges I apply to match my impressions. Y Cvn (La Superba) and X Sge I put in the yellower category. Edited by David Gray, 13 June 2017 - 04:18 PM.